← Giddy up – it’s almost time for ORGATEC! It’s time again for the office furniture sector to welcome its special biennial highlight – the ORGATEC! From the 23rd to the 27th of October, hundreds of manufacturers, salesmen and architects meet in Cologne to exchange ideas on novelties and innovations in the branch. But have you ever wondered how this fair was able to become so important internationally? We have the essential information about the history of the ORGATEC for you. ORGATEC in Cologne is a fair that deals with topics around the equipment and furnishing of offices and buildings. Exhibiting for 65 years it has always been a platform for presenting forward-thinking impulses in the office furniture sector. In doing so the signs of the times are seen and new trends are set, supporting the development of the working world. The understanding and the mind set concerning work environments change through the years, though the mission of innovation stays the same. Various manufacturers are presenting their new products and solutions in the fields of contract planning/ furniture, acoustics, floor, lighting, media technology, systems of arrangement, presentation systems, accessories, IT, as well as software and services. The IBA (Industrieverband Büro und Arbeitswelt e.V.) functions as conceptual sponsor of the event. The history of ORGATEC begins on the October 24, 1953 with the premiere of the first exhibition. At the time it is called “West-German Office Trade Exhibition“ (Westdeutsche Büro-Fachausstellung) and only regional retailers are presenting their products. These 24 retailers from in and out Cologne are organised in the “North Rhine-Westphalia Regional Association for Office Machinery, Office Furniture and Organizational Equipment” and are able to attract roughly 12.000 visitors – all from Germany. The event initially was born out of the need of recognising and presenting trendsetting solutions and innovative concepts in the working world. …is a quote from the first fair catalog. The basic idea of the fair is showing here: progressive thinking about the topic of work. Soon ORGATEC finds its favour with experts which leads to a rise of exhibitors. In 1957 they increase to 147 exhibitors that are presenting their novelties in Cologne. Every two years it further attracts more visitors. Especially in 1971 visitor numbers grow by 11.000 to 36.000 people. At this point it is called “The Orgatech – Exhibition for Organization and Technology in Office and Business” and various supporting programmes such as a congress of secretaries take place at it. Five years later, it is decided that the manufacturers will exhibit rather than the retailers. In 1990 the event receives the name “ORGATEC” and thereby is taking shape as we know it now. 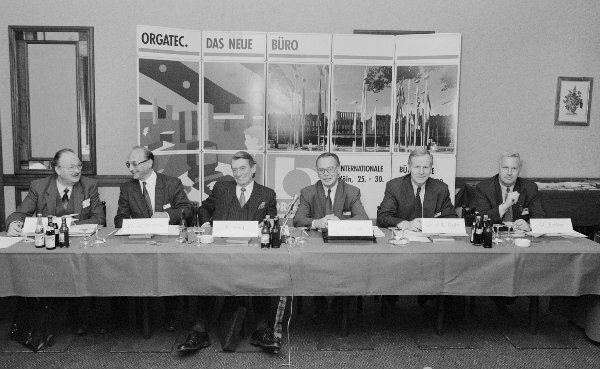 At the press conference in 1990 the new name “ORGATEC” is revealed. In the present era, the fair has made a name for itself as the leading international trade fair for modern working environments and enjoys great popularity. In 2016, nearly 55.000 trade visitors attend the event of which half come from abroad. But the participating manufacturers increase as well – 664 exhibitors from 40 countries present their solutions that year. Two years before it was 7% less. The month of October 2018 commences the next round of ORGATEC, this time under the slogan “culture@work” and we will be there too. This entry was posted in Events and tagged EasternGraphics, events, Orgatec. Bookmark the permalink.